Spring landscaping is a great way to breath a new life into your property and enhances the overall look of your house. However, if you live in New England, growing spring blooming perennials can be a challenge because of its notorious chilly weather. Does that mean it is impossible? Not at all. If you have ever gone on a hiking trip on the Appalachian Trail, you might have observed the rich diversity of its native flora. This is more noticeable in the months of Spring because not many plants can survive the long and harsh Winter. Hence, this proves that even if you live in the northeastern part of the U.S.A, you can still grow some beautiful perennials right on your lawn. Just be sure to keep them in partial shade during the spring as keeping them in deep shade is not ideal for their growth. Listed below are a list of spring-blooming perennials that you can grow in New England. Yellow trout lily – Alongside blue bead lily, yellow trout lily(Erythronium americanum) a.k.a yellow dogtooth violet is also native to Northeastern U.S.A. If you keep them in a nice shade, these can grow into a colony even in wet areas. However, these yellow flowering plants do take some time to grow. So, don’t expect them to grow into massive colonies anytime soon. Fringed bleeding hearts – Fringed bleeding hearts (Dicentra eximia) a.k.a turkey corn, have oddly shaped flowers and fern-like leaves but they look beautiful. These plants are indigenous to the Appalachian mountains. So, growing them in anywhere in New England should also not be a problem. 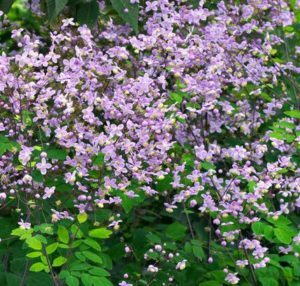 Meadow-rue – Meadow-rue (Thalictrum) is a good choice if you want to grow some tall perennials in your yard. This plant species is not related that closely to the actual Rutaceae family. However, they do resemble them as they have compound leave after every two or three folds. Liverleaf– Liverleaf (Hepatica), also known as liverwort is a herbaceous perennial come from the buttercup family are native to Northeastern America, Europe, and Asia. 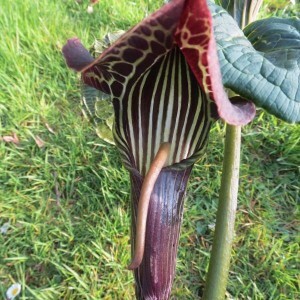 If you are limited in space, growing this plant is a good choice as they don’t need much space to thrive. Roanoke bells or lungwort oyster leaf. This bell-shaped flower of this spring ephemeral are pinkish when they are young and turn into sky-bluish when they mature. During the Spring, you can even notice both young and mature buds on the same plant. Wild blue phlox – Wild blue phlox a.k.a wild sweet William or woodland phlox is a flowering plant of the family Polemoniaceae. The five-petal flowers of this plant can have different pastel colors such as pink, blue-lavender, light purple, or white. Dutchman’s breeches – Dutchman’s breeches (Dicentra cucullaria) is a herbaceous perennial plant that grows with a disjunct population in the Columbia Basin. The white flowers of these plants look like white breeches. Hence, they derive their name from their unusual shape. Creeping dogwood – Creeping dogwood (Cornus canadensis), also known as Canadian bunchberry,Quatre-temps, Canadian dwarf cornel, and crackerberry is a flowering plant of the Cornaceae (dogwood) family. These slow-growing herbaceous shrubs are native to many countries including Korea, Japan, Northeastern China, Northern U.S.A, Canada, New Mexico, Greenland, and Russian Far East. Coolwort – Coolwort, also known as heartleaf foamflower, Allegheny foamflower, heart-leaved foamflower or false miterwort is a herbaceous perennial flowering plant that is native to North America. These plants grow quite well in the shade but they have a fuzzy appearance due to their flower cluster. Bloodwort – Bloodwort is also known as Canada puccoon, bloodroot, redroot, red puccoon and pauson (sometimes). In the past, it was also known as “tetterwort.” These herbaceous perennial flowering plants have variable flower and leaf shapes and thrive in shady areas. If you are growing them, you should know that the red juice of the plant is poisonous. Bog onion – Bog onion (Arisaema triphyllum) is also known in a variety of names such as jack-in-the-pulpit, brown dragon, American wake robin, Indian turnip or wild turnip. These are herbaceous perennial plants that grow from the corm. It is a highly variable species and their height can vary from anywhere between 12-26 inches(30-65 cm). During the end of a year, these plants can sprout some red colored berries. Ground lemon – Ground lemon, a.k.a American mandrake, mayapple, and wild mandrake is a herbaceous perennial plant of the family Burseraceae. They typically grow in colonies and can be as tall as 30-40 cm. You should know that the plant is toxic including the green fruit. However, once the fruit turns yellow, you can eat it if you remove the seeds. If you want to increase the chance of growing healthy spring perennials, you should have a good landscape design. In fact, green landscaping can help you nurture your garden without spending too much time or energy. If you live in New England and want to hire professionals for a new lawn installation on your property, you can check out Stefano’s Landscaping. They are a popular landscaping company located in Saugus, MA and they excel in constructing beautiful home landscapes.